At the D23 Expo today in Anaheim, a brand new Star Wars-themed land has been announced for Disney’s Hollywood Studios and Disneyland Park. This will be the largest single themed-land expansion in the company’s history, encompassing a staggering 14 acres. 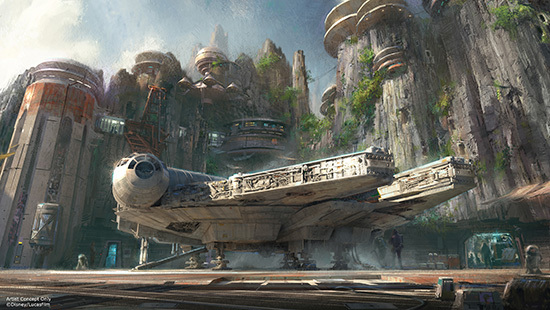 Star Wars Land will feature a new planet, but the name hasn’t been revealed quite yet. The land will be based off of a remote spaceport, where you’ll see all the characters one would expect to see in the Star Wars universe, including aliens, droids and various other creatures. The cantina with authentic Star Wars characters will be an extremely popular place to visit. Everything will fall into the Star Wars universe and will stay in the official canon. The new stories for the Star Wars expansion will be based on The Force Awakens, as well as the original saga. Two new attractions will be designed for the area. One will feature the Millennium Falcon and allow guests to take the controls in a climactic battle between the First Order and the Resistance. Other Star Wars additions to the parks include Star Wars Launch Bay and Season of the Force. 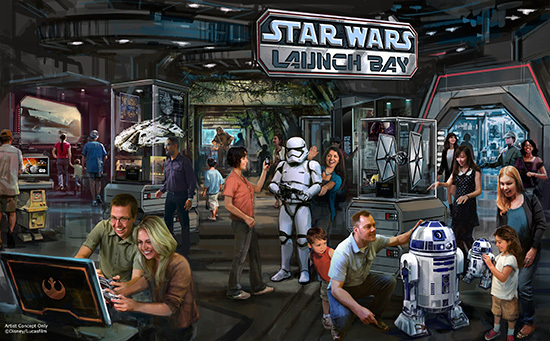 Star Wars Launch Bay will immerse guests in the upcoming film, Star Wars: The Force Awakens, with “special exhibits and peeks behind-the-scenes, including opportunities to visit with new and favorite Star Wars characters, special merchandise and food offerings.” This will be located in the Animation Courtyard at Disney’s Hollywood Studios and in Tomorrowland and Disneyland. In Disneyland, it will share the area with the reimagined Super Hero HQ, where guests can partake in meet and greets with superheroes and check out the Iron Man Tech Presented by Stark Industries exhibit. These will all be open later this year. 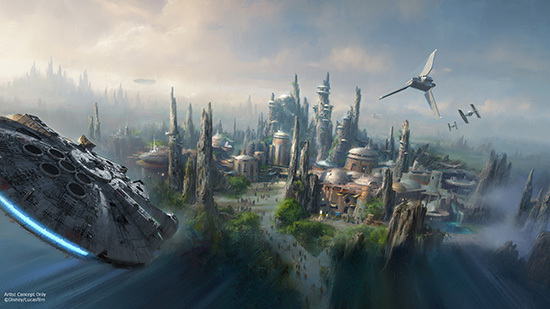 Season of the Force is a seasonal event that will begin in early 2016 at both Hollywood Studios and Disneyland Park. At Disneyland’s Tomorrowland, there will be special themed entertainment, food locations and the reimagining of Space Mountain into Hyperspace Mountain, home to a virtual X-wing Starfighter battle. At Hollywood Studios, a new fireworks spectacular set to the Star Wars scores will take place on weekend nights. Star Tours – The Adventures Continue will be updated to include a new destination and a chance to visit a new world from Star Wars: The Force Awakens. New characters from the film will be seen as well. Jedi Training Academy will be reimagined with new characters and a new villain from Star Wars Rebels. Stay tuned for more information to come about the brand new Star Wars lands at Disney’s Hollywood Studios and Disneyland Park!